With summer travels and home renovation, things have been incredibly busy the past few months. But the renovation is mostly finished and my new studio is operational. If you would like to see my new space, check out this blog post. After a few very small mosaic tasks, I'm almost ready to rejoin the mosaic world and focus on finishing a couple of works. My sabbatical turned quasi-sabbatical and then back to full sabbatical during the renovation has been very good for me. This blog series, as well, has been helpful, and I feel it will be even more helpful if I continue it. So, we left off in about 2006 with the idea of essential mosaic, or work that is uniquely mosaic. My first introduction to the concept was by Gary Drostle, who described it as work that would not be as successful in any other medium. I'm pondering a tighter qualification, that being work that can only be successful in mosaic. What do you think? As the riddle of essential mosaic nagged at me, I attempted to chase it and began creating abstract mosaics and working with a variety of materials. I came to realize that I love line. And simplicity of design. And minimal color palette. And precision. Simplicity of design and minimal color palette gave me a sense of space. Precision gave me a sense of ease, which actually sounds nonsensical as precision is not at all easy. But precision made things make sense, made the pieces make sense to each other—to meet on equal terms, made silence instead of noise. I still feel the same way today, although I now understand how precision is vulnerable to perfectionism. In this time period, I was paying more attention to texture and was experimenting with dimension. I also began thinking in terms of works in series. Music To My Eyes was the first series, based on classical music forms and particular compositions in the form, as well as the use of mosaic gold to express movement. Mosaic gold is quite unique and extremely responsive to light. The texture and shadow inherent in hand-cut glass and stone are also unique to mosaic. But, are these essentially mosaic? Would they be as successful in any other medium? Another series was called Vertical, but it is now called Lines. I was inspired by Brit Hammer's textural mosaics which were worked in lines, or as she referred to them, stripes. She worked mostly in glass and with a lot of color, and in a more relaxed style. Of course, I loved the idea of working linearly, but I did not want to copy her; I had to make it my own. At left is the first piece in the series, Pulse, 2008. I was experimenting with a much wider range of materials and also with beads. It was mostly easy to work monochromatically, in black, gray, and white, but combining the matte marble/stone vs the more highly saturated glass was a challenge that I would increasingly face as I tried to work with more color later on. Also, I did not want it to look like stripes, which presented the biggest challenge, both technically and compositionally, in changing materials—going from smalti-sized tess to very small beads. In retrospect, I think that the best thing about this series was that I worked with so many different materials and learned a lot about how they work together, and sometimes how they didn't. What do you think? Did I make my own lines, distinctive from Brit Hammer's? And is this essentially mosaic? Would these pieces work in anything but mosaic? During this time period of 2007 - 2009, I was working a lot and consciously trying to make art. I guess you could say that I was being an artist. Over time, as I was being an artist, I was increasingly taking myself more seriously, which just might be at the heart of my struggle with being an artist. Part of the reason for this, I have come to realize, had to do with my increased awareness of and interaction with the—thanks to the internet— quickly expanding mosaic world. That's enough for this post. I'll continue with around 2010 in the next post. Thank you for following! Today, there are painters, roofers, and a drywall crew working both outside and inside. Managing the various aspects of our renovation does help keep me busy, but not too busy to miss having a studio and things to make. So, I'll busy myself by going back in time to the year 2007 or so in my mosaic career. Having returned from a very rewarding Orsoni master class experience the previous year, I decided to take the step from hobby to art, and I started making art. Intrigued and inspired by Maestro Orsoni's directive to Think Mosaic, which I talked about in this post, I started down a path—although not fully conscious of it at the time—to explore what I have come to think of as work that is essentially mosaic. Etude, detail (2007) My first attempt to Think Mosaic! 1. The first of the three happenings was when Maestro Orsoni said Think Mosaic, and expounded on what was not mosaic (again, refer to this post). 2. The next happening was in 2008 at the SAMA conference in Miami, I believe, and I met Ilana Shafir and her daughter, Leah Zahavi. I was sitting with a few other mosaic artists in the hotel restaurant when Ilana Shafir and Leah came in and sat down at the table next to us. Maestra Shafir saw that I had a small portfolio of my work with me and she asked to see it. I quite nervously handed it to her. When she saw a photo of L'entrata (left), she said something like If you want to do this kind of thing, you should just paint it! Then, as she viewed a couple of other small, abstract attempts, she said This is honest work. 3. Finally, I read something Gary Drostle had written about a mosaic in a Mosaic Art Now magazine. I think that it was a juror's choice kind of thing and he was explaining why he chose the particular work. He said something to the effect that it was an excellent example of a work that was essentially mosaic—a work that would not have been as successful in any other medium. As a bit of a disclaimer, I'm not heavily invested in the term essentially mosaic or the characterizing adjective of essential. I've only seen it mentioned by Gary Drostle, which either points to my lack of exposure or to a lack of the term's use. As another bit of disclaimer, when I talk about work that is essentially mosaic, I am not referring to a quality characterization, but primarily a type. Work that is essentially mosaic is not necessarily better or more valid that any other kind of mosaic. This is my view. I'll end this post at this point and let you ponder the idea of essential mosaic, as I have come to understand it based on my recollection of the comments of Orsoni, Shafir, and Drostle. In my previous post, I said I would continue with 2007 in my next installment. Pardon me while I wander off a bit. Over the years, I've found the label of artist uncomfortable. This has a lot, or maybe everything, to do with my relationship to the word—the idea—of artist. Funny how our connection to a word definition can be so powerful. That's because it's not just a word; it truly is an idea. And we can be so attached to our own ideas, can't we? If I had been artistic as a child, if I hadn't grown up mostly oblivious to art, if I had a degree in art, or probably a number of other if-onlys, then perhaps I could embrace the artist label? Maybe. But I'll never know, since none of that happened. Clearly, whatever an artist is, it's not what I feel I am. What a bunch of silliness! I think that sounds like me. In my last post in this series, I had made it to the early-mid 2000s. Around 2005, I had my first website, which was just one of the benefits of having a computer nerd for a daughter. Not many mosaic artists had personal websites at that time, but within just a few years that would change. The internet gradually replaced my well-worn books as a strong source of inspiration, as I searched and increasingly found more mosaic sources online. Early in 2005 I found some information—some kind of blog post I believe—about Orsoni's Master Classes. After much thought, I decided to look into attending a 2-week class in June of 2006. This was quite a big thing for me to do, to travel to Venice all by myself, and for 2 weeks! At the time, I had been making mosaics for almost 10 years. However, I knew very little about art. I had no educational background and never really thought of art much beyond it being an aspect of room decor. My Orsoni experience proved to be quite pivotal for me and, although I did not know it at the time, started me on the path to becoming an artist. Master Class. 2006. 20" x 16" | 51cm x 41cm. Smalti, mosaic gold. On left is the mosaic I made in my Orsoni master class. This was a huge challenge for me! First of all, nippers were not allowed in class—only hammer and hardie. I had virtually zero skill with the hammer, which resulted in oh-so-less-than perfect cuts. I fussed and fussed, trying in vain for a degree of precision that was unobtainable. I would try to force myself to accept what were, to me, unacceptable cuts. Antonella, observing my frustration, kindly laughed and said something about it being against my nature. It was that perfectionism that I wrote about in my last post, a perfectionism that, up until this point, had been my ally. But in a classroom environment when using new techniques, my perfectionism was proving to be a menace. I chose the design so that I could learn a little about shading and blending. I could have done a bit of shading with pencil, perhaps, but translating it to individual pieces of color really was a challenge for me. Amazingly, I did get this panel finished before the class ended. One day during the class, Lucio Orsoni was showing us around the gallery/showroom which displayed some of his stunning, large-scale gold works, a few of Antonella's pieces, and some other mosaics. One of the pieces was a beautiful portrait, in what I believe was the Venetian double-indirect method, done quite some time ago after a painting. We were all oohing and aahing over it when Lucio said This is not mosaic! Note that he did not say This is not a mosaic. He explained that it was a copy of a painting—done in service to a painting. At that time, I did not quite understand his point, neither did I understand when, in class, he would say Think mosaic! But, he planted a seed, so to speak. Overall, my Orsoni experience was quite positive, and I returned home fully energized and had begun my transformation from hobbyist to artist. From that point on, I was going to make art! Of course, my first project would be smalti, Orsoni smalti. I had taken a picture from the classroom, which overlooked a balcony, and I decided to mosaic that image. I did my best to recreate that image with as much detail as I possibly could, and it was very, very difficult! I was proud of my accomplishment. When Maestro Orsoni told me that my work was technically perfect, well, that was quite a compliment. Too bad that it would be some time before I realized that there was something very important in what he did not say. L'entrata. 2007. 42" x 32" | 107cm x 81cm. Smalti. I love this mosaic and in no way would I say that it is not a good mosaic. I achieved such fine detail and it really is a beautiful piece. Ironically, however, I believe that this work illustrates Orsoni's point when he said This is not mosaic! I had faithfully copied a photograph; the mosaic was created in service to the photo. It is a mosaic, but is it mosaic? This seemingly subtle distinction, as I have come to understand it, gradually revealed itself to me throughout the years of around 2007-2009, and I began to learn to think mosaic in the spirit that I believe Lucio Orsoni meant. Well, I think this is enough for one post. I'll continue with 2007 in the next installment. Last weekend, I moved the contents of my warehouse—a spare bedroom that I took over years ago to store not-commonly used mosaic materials, saws and tile cutters, various substrates and 3-d objects awaiting mosaic attention, project rejects and failures, and other miscellaneous mosaic and non-mosaic stuff—into a guest bedroom. This was in anticipation of our upcoming remodeling that includes taking out half of that warehouse/bedroom. It's at the end of the hall and we'll be opening up that area as it leads into the new studio wing. Moving all the warehouse contents was like a trip down mosaic memory lane as I transferred inventory by phase of my mosaic history. What a nice collection of 4" x 4" glazed ceramic wall tile I have, in bright and pastel yellows; orange; lipstick red; pink; burgundy; cobalt, navy, and sky blues; eggplant; lime, forest, and true greens; gray; black; brown; turquoise; periwinkle; and, of course, white and off-white. These, along with my assortment of porcelain pool tile and the thick unglazed, miserable-to-cut, bathroom porcelain that I relied on before I discovered Cinca and Lyric, reflect my first year or two of mosaic adventure. The crate of various dishes and cups, combined with bins of broken ceramic and porcelain vases, pots, and other decorative things, establishes a moderate picassiette inventory reflecting a couple-year period in the early to mid-2000s. Then there's the stained glass and gems—early 2000s—and mirror and Van Gogh glass, with which I worked extensively from around 2003 - 2007. From 2000 - 2006, I was focusing primarily on decorative pieces, but ventured into a few wall art pieces, which I shared in post #4. Through the decorative work, I was developing style and method. I can see that now as I am looking back and reflecting over the course of my mosaic path, even though I was not aware of it at the time. An invisible force, like some kind of gravitational pull, attracted me to line and pattern, simple design, and minimal color palette—my rules of design, so to speak—of which the vase at left is an example. Like an organizing principle, these rules of design both gave birth to and were made manifest through a methodical approach to evaluating what needed to be done. The result, more often than not, was geometric and elegant. Upon the discovery of mirror glass and Van Gogh glass, I discovered that I could cut such glass into various, and often small, geometric shapes and combine them to make intricate and sparkling patterns (see bottle collection below), beautifully suited to decorative projects like bottles and mirror frames. Again, applying this technique required a methodical, mathematical approach that I found very satisfying. And there it is. I am a perfectionist. Or, let's just say that perfectionism has long been like a ghost in my life; it is at once both a thing that chases me and a thing that is just ahead of me. It chases me as I run from the truth that it cannot be achieved, and it is right in front of me, taunting me and demanding that it must be achieved. Perfectionism seemed like the—dare I say—perfect companion to me in those first years, for about the first decade, and, indeed, I believe it was a good friend. It was always ahead of me, daring me to get ever more close. And so I did. However, I did not see it in my rearview mirror during this time. I don't know if that is because it was not there, or because I wasn't looking behind. Do you have trouble fitting into the label of artist? It feels quite natural for some people, but it has never felt like it fit me. As useful as labels are for us human beings, I've always been challenged to own a label but not identify with it. My idea of, and relationship to, the label of artist needs some work. And I may be onto something. In my first years of mosaic-making, I was fearlessly ambitious, the way that a child is fearlessly ambitious. They have no fear because they don't know to be afraid. It's that ignorance of bliss, Garden of Eden kind of fearless. The unknowns are unknown, not even suspected. What a wonderful place from which to operate! Children accomplish astonishing growth and mastery in their first few years of life, of which no small part must be due to being free of fear. As an adult, is it possible to truly be fearless? We talk about feeling the fear and doing it anyway, but I'd rather not feel it - not as it regards making mosaics. (Being uncomfortable identifying as an artist, I'll also refrain from saying that I make art. I'll just be a mosaicist and say that I make mosaics.) In trying to free myself of the artist label, to un-become an artist, I realize that I am really just trying to find a way to be fearless again. We carry real and imagined critics with us constantly—a veritable babble of voices, some remembered, some prophesied, and each eager to comment on all we do. Beyond that, even society’s general notions about artmaking confront the artist with paralyzing contradictions... You’re expected to make art that’s intimately (perhaps even painfully) personal—yet alluring and easily grasped by an audience that has likely never known you personally. Of course, it's not really about the label itself—although I recognize that it's quite a loaded idea to me, or whether what I am making is or is not art—as that is not for me to decide. It's about how my relationship to mosaic-making changed as I started thinking in terms of being an artist and of making art. And it's not as though it was, in and of itself, a bad thing. It wasn't. Until it was. And it was necessary. Until it wasn't. Well, I just needed to wander off and ponder fearlessness. I'll go back to the early to mid-2000s in my next post, which would lead me out of the blissful ignorance of my small private mosaic world and into the public world of the blossoming mosaic community. Circa 1997. I was pretty obsessed with mosaic. I saw mosaic everywhere. Either something could be transformed by mosaic, or it could be broken up and used for mosaic material. I wasn't an artist; mosaic was just an obsessive hobby. After my first birdbath, I decided that I would just make birdbaths - for forever. I made two more, and realized that forever had come not soon enough. I was ready to not make anymore birdbaths. I resumed my exploration of material and style via primarily decorative pieces. Stained glass caught my attention. It was relatively easy to find, to cut, and it was inexpensive. It was at a stained glass shop that I first found wheeled nippers. Wow! What an invention. I took a few stained glass classes to learn how to cut glass and I was off in that direction for a while, trying a lot of glass-on-glass stuff, certain that I would do that for the rest of my life. There was my picassiette phase. I loved the chunkiness and mixed patterns of broken dishes and ceramics. Yes, I bought things just to break them up for material. Playing with picassiette led me to bottles, which still hold a bit of interest for me. By around 2000, I started focusing a bit more in the wall panel direction and ventured to make a few largish ones, one being a portrait for which I was woefully inadequate. But it never occurred to me that I did not know what I was doing, so I gave it a shot. Fearlessly ambitious and deficient in both self-doubt and expertise from which to judge my success, I enthusiastically charged ahead. Though accomplishing much more technically than artistically, due to the sheer act of physically doing it, my ability to assess my own work was quite limited. While books offered a few tips and critiques, I was mostly oblivious to my technical errors. Still, I was growing, in that unconscious way that is a by-product of just making one thing after another. It was unavoidable, I suppose, that I would slowly and quite by accident be likewise growing artistically, learning a bit about line, composition, perspective, and color. Looking back, I see that I was very content to just be making things. But then, my mosaic world was quite small. It was just me. I was not part of any mosaic community. SAMA was not in existence until 1998 or so, and there was no Facebook or CMA (not sure when MAO was formed). I was probably still ordering tiles by phone, although I recall the perfect joy of spending time in local tile stores and home improvement stores like the no longer Builder's Square. What fun! My, how things would change in the next decade! Suppliers would be online, and the internet would be bringing the work of mosaicists from all over the world into my own home, my own studio. With the holidays well behind me and the adult kids back to their lives, the house was quiet again. I decided it was time to clean my studio, which had become rather piled up with remnants of the Thomas decorations - spray paint, axles and wheels that I made out of hardware for the snack train, railroad track cutouts, etc., a couple of wood specimens in need of some preservation, shale specimens that I was... am... continuing to collect from our woods when out with the dog - basically, just stuff, the kind of stuff that seems to pile up. While cleaning I came across 5 unfinished mosaics that I was confronting for not at all the first time. The oldest one was from 6 years ago and, although I muddled the idea of it early in its execution, I could never give up on it. I thought it was a cool idea when I started it, and every time I found myself considering what to do about it, I still thought it was a cool idea. Last year, I decided to either come up with a way to make this cool idea work or give up on it and throw the dang thing away. So I rethought it and came up with a reset plan. Unfortunately, it was about the time that I was running out of mosaic fuel so I turned my back on it yet again. So here it is at right, my 6 year old neglected concept. A simple repeating pattern of lines in a grid of 9" x 9" squares - beautifully geometric, implying all those triangles and teasing other angular shapes. Just my kind of thing. The lines are in bumpy gold, raised on thin wooden rods, so the gold lines will extend above the surface of the mosaic. The sides of the gold lines were painted (brown, hmm...), which I thought would give a lot of interest from different views and the bumpy gold would reflect those elegant lines. For some mysterious reason, I proceeded to use a mix of light, neutral tess, cut very intricately (as you can see in the lower image), kind of like an overhead city view, with little crystals, shells, minerals imbedded. I got one of the 9 squares done like this, and then I think I got distracted with a big commission. By the time I was revisiting it, I realized that I had muddled the concept, needed more contrast, and there was no way in hell that I was going to do 30 square inches in that ridiculously intricate work. Last week, I decided that it still has potential to be a very striking work, just the kind of thing I would love, so it's a keeper. Two other of the 5 should also be finished, I concluded. One of the 5 should be abandoned - just tossed, and the last one should first be cannibalized for it's good mineral specimens and then abandoned. Will I actually finish any of the 3? I have no idea, but I do feel a spark of interest. I found myself puttering around in my studio in the following days, not for any length of time. It felt so good to be puttering in my studio. The idea of maybe doing something to contribute to that 6 year old mosaic reaching its glorious potential slowly started becoming less repulsive, then palatable, then, well, let's just see if I can get that stuff scraped off and then reassess the situation. Over the weekend, I scraped and yanked the beautifully and intricately cut, and completely wrong, marble from the Wedi substrate, pulling up most of the fiberglass mesh and foam core along with it. I had doubled the Wedi, which was working to my advantage these 6 years later, and the damage was isolated to about a 9" square corner. I was able to salvage a lot of the foam, pieced it back into the hole, and secured it with Weldbond. After it dried, I finished patching with thin set. After sanding it down, it's almost good as new. I've got to change something else to accommodate my reset plan, and then I'll see if its time may have come. Let's not get carried away. I'm still on sabbatical, although I may qualify it as a sabbatical from any new work. Although I have some ideas percolating - all because I finally went in to clean up my studio last week - I don't think I'm where I need to be to birth anything new. My head is not on straight yet. Mosaic just became so consuming, I feared more an escape than an expression. I don't want to get lost again. I don't want to do it for the wrong reasons. I don't want to make anything that doesn't truly need to be made. Wood specimen with a story, and a future date with mosaic destiny, I'm fairly certain. Roughly 8" x 3". Did you think that this series would move in a chronological order, from past to present? I suppose that I did. But it won't. Today, I feel the need to reflect on more recent happenings. Well, that all sounds rather serious, doesn't it? Dishonest, corrupted, lost my way - indeed. What way? Did I ever really even have a way? No worries - I will not lead you into the psycho-emotional brambles of my interior forest, at least not so obviously. It's just that I received a nice email today from someone who had read my blog. She was very generous in sharing that she can relate to such life predicaments, and saw a lot of parallels between us. It made me feel like I should provide a little backstory. Now, it's not just about the art. Is it ever? In recent years I've had a lot of other things happening in my life that were bound to have an impact on my mosaic passion, not the least of which is that I have been doing it for almost 20 years. My kids are now all grown; I have been blessed with two grandchildren of whose lives I have the honor to be a regular part; I lost my younger brother in October 2014; and I spent the month of December 2014 with my daughter, in San Jose, as she underwent her gender reassignment surgery. Although I felt prepared, psychologically and emotionally, for Allison's transition surgery, it seems my body was still to take the blow. I was sick with a terrible cold, sinus and respiratory infections for the entire month. That was probably the worst month of my life, being so sick and needing to nurse my daughter through that. I had to be there, no question about that. No other place that I could or would have been. But, whew! Throughout the remainder of winter and into the spring of 2015, I found myself running out of mosaic fuel. I finished up a couple of things. I tried to start a couple of new things. I gave up on those couple of new things. The last mosaic I made was in honor of my brother, Loner, in April. I abandoned the studio before summer started, except to make some decorations for my two grandsons' Thomas the Train joint birthday party in November. I had decided to take an indefinite sabbatical. I have been cooking a lot in the absence of mosaicking, watching cooking tutorials and lessons online, and studying about wine. I'm feeling much more competent in the kitchen and truly enjoying it. (My family seems to be enjoying it too.) So that's good. But let me tell you about what happened last week. This is the first post in what I intend to be a series of posts reflecting on my journey to becoming, and un-becoming, an artist. Since Spring of 2015, when I decided to take a break from my work and sort out my relationship with it, I began the un-becoming leg of the journey, and I'm realizing that it actually has very little to do with mosaic-making. In recent years, I've struggled under the weight of the artist label. I spent the first 45+ years of my life with no connection to the label whatsoever. I never thought of myself as an artist, nor did I have such a desire. I hardly considered myself a creative person at all. I did not even think about art very much, other than it being something decorative to support a room or an activity that children did for fun in school. Somewhere around 1996 we began the adventure of building a house. In short order, we found ourselves watching HGTV on the weekends and getting all kinds of ideas. This is how I was introduced to mosaic in any serious, non-Pier 1 Imports sort of way. Some show on gardens of Barcelona led to me being convinced that I must have a mosaicked fireplace surround in what would be my husband's study in the new house. So, that's how it started. One thing led to another, and I decided to try my hand at making a mosaic. Between my first rather pitiful attempt, at right (Why did I arrange those leaves like that? Why did I grout it with white non-sanded? God bless grout colorant. 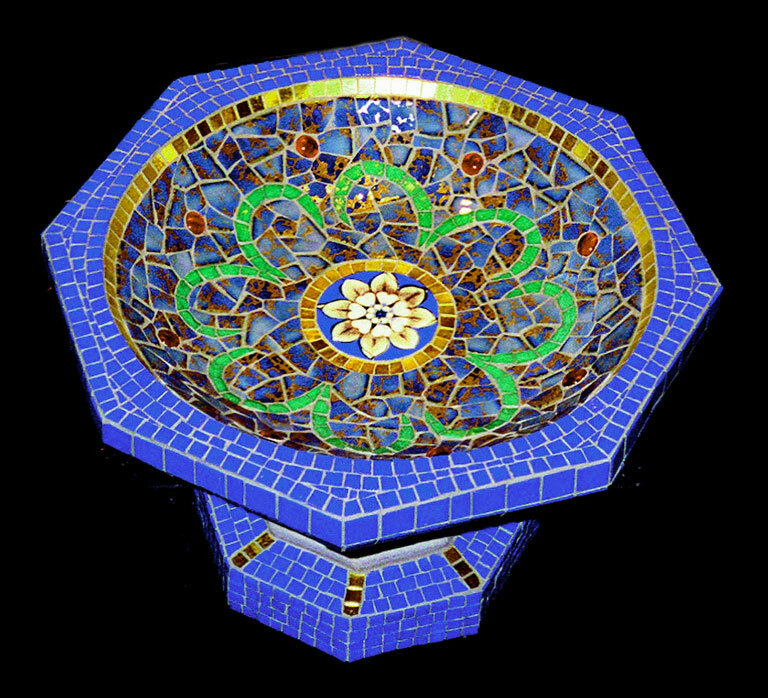 ), and the fireplace, I dove right into the mosaic pool and made as many mosaics as I could figure how to make. I bought and studied mosaic books from local bookstores. I figured out where to buy materials before they were all over the internet. I experimented with substrates and adhesives. I learned to cut with traditional tile nippers - I did not find wheeled nippers for a couple of years. I learned some things not to do. Sunflower. 2' x 2'. First mosaic attempt. 1995 - 1996. Ceramic and porcelain pool and floor tiles. At left, my very first experiments with smalti, which I ordered by phone from Mountaintop Mosaics. I knew that I wanted to do the fireplace in smalti, but it took some time before I found some and was brave enough to use it. I combined the smalti with unglazed porcelain (bathroom tiles), some pool tile, and a bit of gold. Designs were inspired by some illustrations in a book. I was not yet a year into mosaicking. About a year later, as we moved into our new home, I was convinced that I was the person to mosaic that fireplace surround. And I did. It turned out okay - quite well, actually, considering my experience level. It has its issues - how could it not? Funny, because when I look at it, I don't see its problems. When I look at it, I remember the person who took it on without any fear or insecurity - that person who wasn't an artist. Tropical Fireplace Surround 1996-1997. Smalti, mosaic gold. Below is a slideshow of a few of the things I made in that first year. The kitchen table originally had 4" x 4" white ceramic tiles and a light wood finish. Another example of me just jumping in without fear or even a second thought. I used mostly pool tiles and some off-white ceramic tiles that I bought from a local tile store. Once all pieces were glued, I proceeded to grout it with antique white grout. What a disaster! Fortunately, I found some grout colorant in the color Haystack which saved it. Well, it's not perfect, but we still use it in our kitchen. As can be seen, I was not making anything all that spectacular - mostly decorative things for around the house and small wall panels inspired by others' designs. I relied somewhat heavily on stencils for the fireplace design. Well, this was all before I was an artist... and I was having a blast!